6 TUBERS (not seeds!) Create a rainbow of color in your garden with all these glorious flowers! Plant these wonderfully fragrant flowers near your porch, patio or bedroom window to enjoy their sweet aroma all night long! USA ONLY. 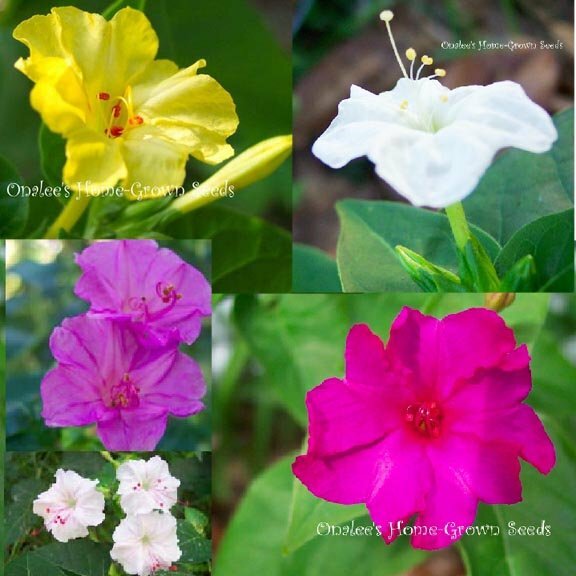 You'll receive 6 medium sized Four O'clock (Mirabilis jalapa) TUBERS (not seeds, Live tubers!) of mixed colors. These tubers are about 2 - 3 in circumference and 4 -6 long (like baby carrots). The plants themselves are about a foot high, but will be removed for shipping - you'll get just the TUBER. I will try to get a mix that includes all the colors I have, but I can't GUARANTEE the colors you'll get. The possiblities are: WHITE, FUSCHIA PINK, LIGHT PASTEL PINK, MAGENTA PINK and YELLOW. If you have one color that you prefer over the others, let me know and I will *TRY* to get more of that color for you. This is perfect for those of you who tell me you are 'seed challenged" or anyone who just wants a head start on the growing season! Create a rainbow of color in your garden with all these glorious flowers! These are perennial tubers (zone 7b and warmer) with fragrant 2 trumpet shaped blooms that come out in late afternoon and stay open until early morning. They can be grown in full sun or partial shade, and can get to 3" - 4" tall by their second or third year. Plant these wonderfully fragrant flowers near your porch, patio or bedroom window to enjoy their sweet aroma all night long! Because they are tubers, they tolerate infertile soil, drought, and neglect. Hardy to USDA zone 7b (+5?F). Treat as a self-sowing annual in colder zones or lift root and store like a tender bulb for replanting in the spring.